The FIFO method stands for first in first out, and LIFO method stands for last in first out. FIFO and LIFO have a huge effect on how you end up reporting on your business profits. Depending on the type of business you run — and where you run it — you may not actually have a choice in which of these systems you’ll use. The important thing is to understand how they work and then stay consistent throughout all of your records and reports. This will minimize any possible headaches when it gets closer to tax season. The acronyms are fairly self-explanatory, and they’re basically opposite ways of tracking the value of your ending inventory (EI). What isn’t so obvious is that FIFO and LIFO aren’t about tracking physical items, but rather about recording the costs of those items to your business. If you pour three different bags of M&Ms into a jar, you don’t actually have to find and count the batch that first made contact with the bottom of the jar. All that these systems require is that you account for the cost you paid for each of the three bags of candy, and when you ended up selling each batch. What’s interesting is that there would actually be no real difference between FIFO and LIFO if it weren’t for factors like inflation. However, when you factor in inflation (which raises COGS over time), then a company that uses LIFO will end up reporting less profit than if they were to use the FIFO system. This is a crucial difference between these two costing methods, because it can directly affect the amount of tax that a business pays. In general, the worldwide standard is the FIFO method. LIFO is not allowed in most countries due to how it can understate profits, but it can be used in the United States. We’d advise you to check with your accountant about which system you should be using to track your inventory, since it varies by region. Aside from region, the type of business you manage will also determine what kind of costing system you should use. FIFO is great for accurately reflecting the actual current value of you inventory; it’s kind of like playing a game of Tetris with your products, since you always sell the oldest items first. This means the stuff that’s left over in your inventory after sales will be the most current or fresh product. One example of a business model that the FIFO method fits is one that deals in perishable goods. A bakery produces items that expire after a certain time and either become inedible or otherwise lose their value, so FIFO makes a lot of sense. The LIFO method isn’t as commonly used because it is not allowed by the International Financial Reporting Standards (IFRS), due to how it affects the reporting of profits. It also is not a great indicator for the actual value of your Ending Inventory. Think about it this way: if you’re always taking candy from and adding to the top of the jar, how much are those old candies at the bottom really worth to you any more? If you’re using LIFO, it could be months or years before you get to the product you first purchased — if it ever happens. Here’s what it would look like if Archon Optical used LIFO to report on the past three months. 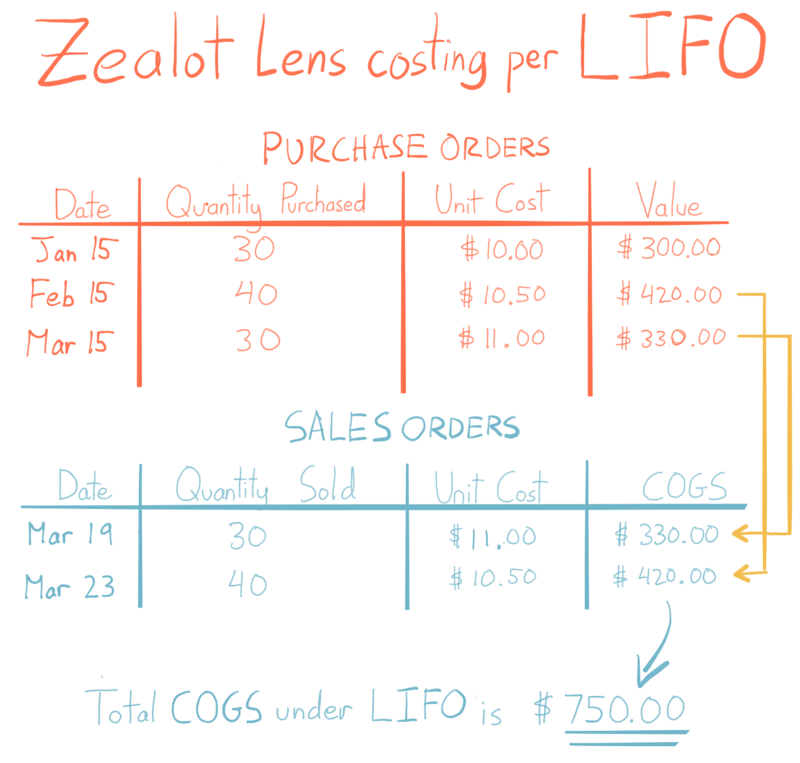 Notice that the costs are still the same, but the COGS for recent sales is higher under LIFO. This is significant because a higher overall COGS means that the company will report less profit for those sales in January and February. Those tables will lengthen over time, as you buy and sell more of your product. You’ll also need one set of purchase and sales tables for each product in your business. As your business grows, this can quickly become a lot of separate numbers and tables to manage. Leave FIFO and LIFO to inFlow! It can be a little exhausting to track all of the FIFO and LIFO layers manually, so why not use a tool that’s designed to track this for you? 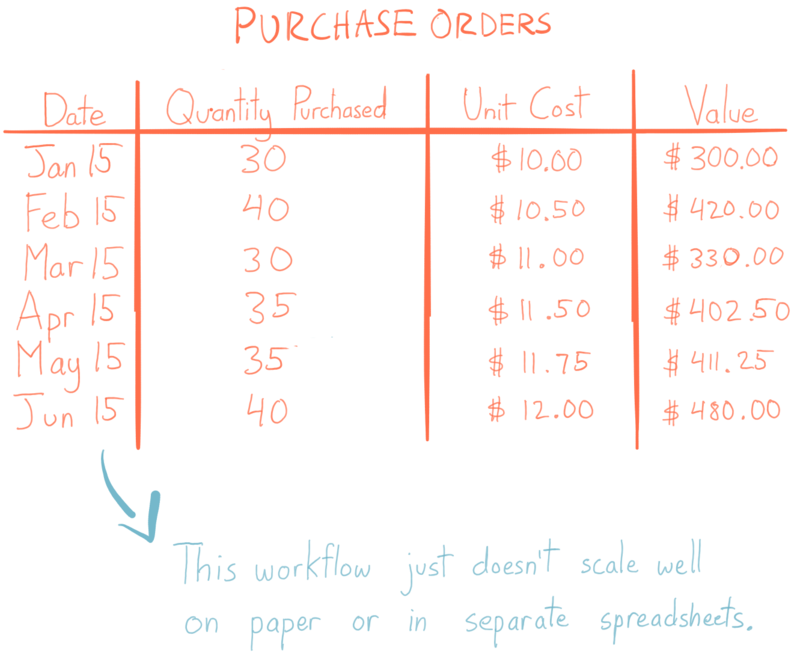 With inFlow Cloud, all you need to do is enter purchase orders and sales orders, and our servers will crunch all the numbers for you. When you make a sale, inFlow knows which cost layer you were selling from (was it from the March shipment, or the June shipment?) and it can also show your current cost of goods at any time. 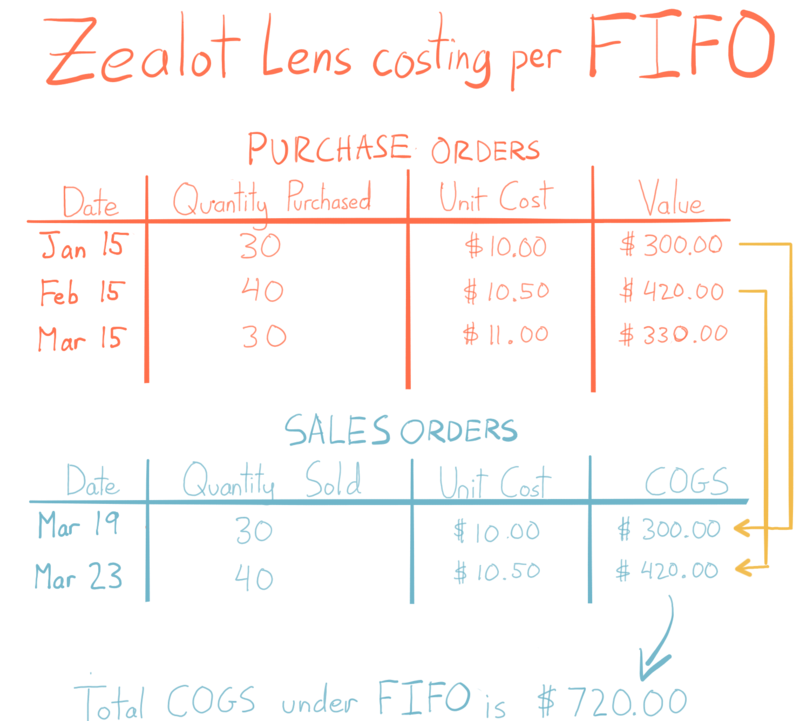 It’s easy to simplify your FIFO and LIFO cost tracking with inFlow Cloud. Since Inflow can’t help me or my business with our FIRST IN FIRST OUT problem, should i go to Fishbowl who seems to have the FIFO problem worked out or do you suggest some other inventory program. I have 3 days to fix this mess that i’m in. inFlow should be able to take care of FIFO no problem. What specific issues were you having? Please send a quick email to support@inflowinventory.com and they’ll do the best they can to help you out. I apologise, but, in my opinion, you are mistaken. Let’s discuss. Write to me in PM. Sorry Pablo, I tried emailing you at the email address you left here on the blog, but it didn’t work. If you’d like to talk about the post, please email us at info@inflowinventory.com and ask for Thomas. That way I can make sure to follow up via email.